An article in the Jewish Daily Forward explains how Google killed the cult — but not why it can’t kill the scam. This image is a screen shot of the article. It’s a good question. There are, of course, three answers. First, computers make it MUCH more efficient for scammers to reach potential victims. An SEO-savvy scammer can create an online presence that lends legitimacy to the scam, and reach thousands of people in the time it would have taken an old-fashioned scammer to knock on a few doors. Plus, the scammer can reinvent himself any time the pressure gets too heavy. Just register a new domain, edit the business name on the content, and you can be back in business with a “clean” reputation in minutes flat. Today, the Atlantic says that you’d have to spend 991 hours working at a minimum wage job to pay tuition at the lowest cost public university — and that’s less than half the cost of a college education today, now that books and fees will more than double the cost. That means you’d have to work 20 hours a week for a full year (52 weeks — no vacation or holiday time off) to earn enough to pay tuition for a single semester. And that’s without the other costs most college-age kids incur for things like transportation, food, connectivity (WiFi, cell phone), or entertainment. What 18-year-old actually manages to save 100% of a year’s wages? If you don’t have money, you don’t have time to “find yourself” through a cult. But just because young people aren’t joining cults doesn’t mean they aren’t looking for spiritual growth, or that they aren’t vulnerable to the kind of predators who build cults. The recruitment venues have changed, and so have the numbers of kids falling prey to them. But the real reason that cult participation is down while scams (online and off) continue to flourish is hubris. Hubris, simply explained, is the sin of pride. Scam victims, by and large, become victims because they prided themselves on their ability to spot scams, and didn’t bother to stop and do their homework before falling prey to the scammer. Computers have automated the process of identifying and targeting vulnerable victims. Once upon a time, con artists had to rely on their own acting skills and personality to convince the gullible to hand over money or credit card information. But now, it’s more often digital communications skills than personality. Dallas attorney Sean E. Tuma, one of the country’s leading legal experts on computer fraud, often opens his speeches with the question, “When was the last time you heard about a fraud that didn’t involve computers?” In a presentation earlier this year to the State Bar of Texas, Tuma said that 18 adults become the victims of computer-related fraud every second — and that 46% of online users have been scammed online. Some of the scams can be easily prevented by using a search engine to check the facts, or visiting one of the many anti-fraud sites like Snopes.com or simply using some common sense. For instance, if you get an email, or see a social media post that encourages you to “forward this to all your friends”, chances are good that it’s a scam. Supposedly free giveaways in exchange for forwarding emails. False appeals to help sick children. Pointless petitions that lead nowhere and accomplish nothing. Dire, and completely fictional, warnings about products, companies, government policies or coming events. Another clue to potential scams is that most hoaxes don’t provide verifiable details. Genuine competitions, promotions, giveaways or charity drives will usually provide a link to a company website or publication. Real virus warnings are likely to include a link to a reputable virus information website. Emails containing Government or company policy information are likely to include references to checkable sources such as news articles, websites or other publications. If the email or social media post links to a legitimate site, you’ll be able to use a search engine like Google, Bing, or Yahoo to find the information and the company behind it. Sites like Snopes, Hoax Busters, the FBI’s Internet fraud website, and Fraud.org are great places to check things out before you consider forwarding something — or giving someone money in response to an online plea. Unfortunately, individuals and business are rapidly falling prey to a new kind of online threat: organized criminal gangs who are stealing valuable information by breaching the security of computer systems that hold the data. Katie Morell’s 2014 book Stolen Identity is a practical guide to avoid becoming the victim of the fastest growing crime in the U.S.: identity theft. SafeNet’s Breach Level Index reported that during the first half of 2014, 70 million records containing important personal information (such as social security numbers, credit card numbers, or financial information) are stolen every month. That’s an average of 2 million records every day or 93,000 records every hour.It used to be that people were worried about using their credit cards online, for fear that someone would get access to them and order merchandise without authorization. That was a kinder, gentler time. Nowadays, you don’t have to have a credit card — or an Internet connection — to be the victim of thieves who can ruin your credit. 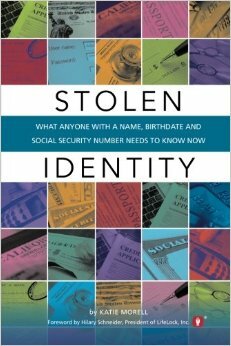 Katie Morell’s 2014 book Stolen Identity offers a range of tips and techniques for “anyone with a name, birth date, and social security number” and points out that online searches are just one of the tools used by identity thieves. “No one is immune,” she writes, adding that nearly 12 million Americans have fallen victim to identity theft, and only a fraction of those identity thefts are ever traced to an online security breach. I know that much is true from my own experience as the victim of identity theft. In my case, someone who worked in my office and signed my name better than I do (their handwriting was neater than mine) opened a series of credit cards, bought a car, and even paid some of the credit card bills with checks stolen from the company. They got the details they needed — social security number, bank account numbers, salary figures for the applications — from paper records stored in the small office which never had more than a dozen people working in it. Fixing the problem was simple in some cases, as major credit card companies like VISA and American Express accepted my affidavits and fraud reports — but some other companies (notably a firm called Americredit and Capitol One) did not. More than a decade later, my credit report still suffers from the massive hit it took from the thief who stole my identity. Because the car purchased and registered in my name (albeit in a state I never lived in) was repossessed, that stain on my credit report will never go away. My lawyer has (unsuccessfully) fought the credit bureaus and credit companies, and the best we’ve been able to get since I can’t “turn in” the culprit since I don’t know (for sure) who it was is to have a note added to my credit report that says I was an ID theft victim. In a way, I’m lucky — I’m not dependent on a good credit report for a job. Others aren’t so lucky. I know a 23-year-old college graduate whose degree in accounting is virtually worthless because she was a childhood victim of identity theft. Someone (probably a family member) used her name and social security number to open a bank account, credit card accounts, and even rent an apartment while she was still a minor. The identity theft went on for years, until she was about to graduate from college and applied for a “first time buyer’s” program to purchase a car, only to discover she had a horrific “record” for things that happened when she was still a child or young teen. A year and a half after graduation, she’s still working in a restaurant, and fighting to get her credit record cleaned up so that she can get a professional position in a field where a bad credit rating is an absolute barrier to entry. Morell’s book includes a number of similar stories of young people who discover that they were victims while they were still children, and offers specific tips and techniques that parents and young victims can use to restore their financial reputation. I wish I’d read a book like Katie Morell’s before I became a victim, but I am not sure that I would have been smart enough to follow her advice. It goes back to the sin of hubris. I honestly never thought I could become a victim, because I was very careful with my credit cards, pin numbers, and online purchases. Don’t make the mistake I did and trust the wrong person with your personal information — it’s a long-standing nightmare that can make almost everything in life from getting medical care to buying life insurance, owning a home or replacing an aging car, much harder than it should be. Gallery | This entry was posted in Family, Law, Management & Entrepreneurship and tagged identity theft, Internet fraud, Internet hoaxes, online scams. Bookmark the permalink.